Summary: Using Node-RED and Home Assistant and would you like to build a custom full room wake-up light? In this post I show my setup and explain how to build a wake-up light using Node-RED. In a previous post I showed a wake-up light using Home Assistant and the default YAML configuration. In this post I’ll show my current setup which makes use of Node-RED. As with my previous system, this wake-up light’s function is to light up my complete bedroom just before I need to wake up. The system works with any smart lamp that is compatible with HA, this includes Philips Hue and IKEA Tradfri lamps. I use it with a few GU10 bulbs (like the Hue GU10 lights). If you want you could even use some color-enabled bulbs to include a nice color transition mimicking a sun rise. In this post I’ll show you how to build this system. 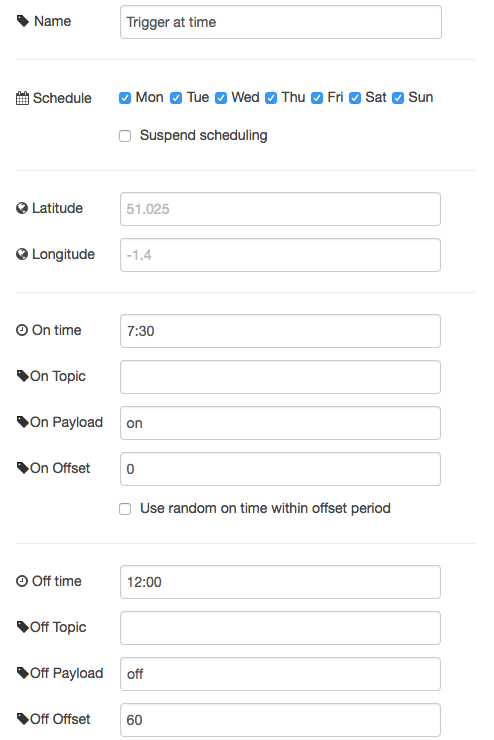 The automation will be configurable (on/off, time) and has a switch to disable it on weekends. Three GU10 Zigbee smart lights. I use 3 Innr GU10 lights(not available in the US) but you could also use something like the lights from Philips Hue. These components are just an example. A minimum requirement is a device that runs Home Assistant and Node-RED, and a smart light that you can control. For controlling the settings of the wake-up light I use the same widget as with my previous post. Please see that post if you would like to read more of the details. An input_boolean to enable or disable the system. 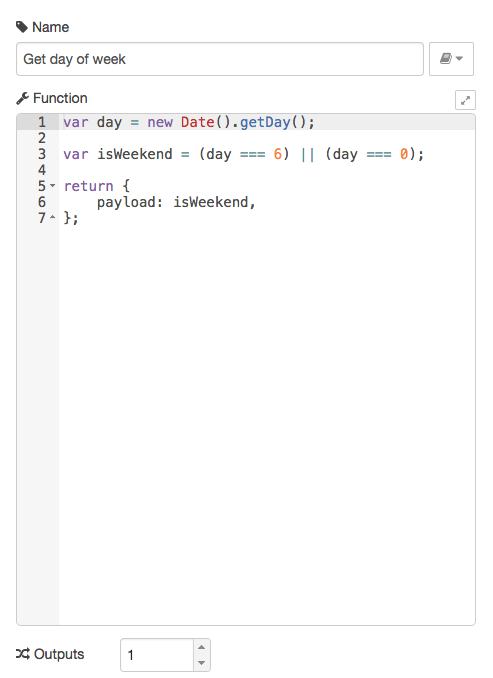 A second input_boolean to enable or disable the system on weekends. A input_datetime to set the time of the wake-up light. name: "Enable Wake-up on weekends"
Note: If you want to persist the values between restarts of Home Assistant remove the ‘initial’ value from the configuration. 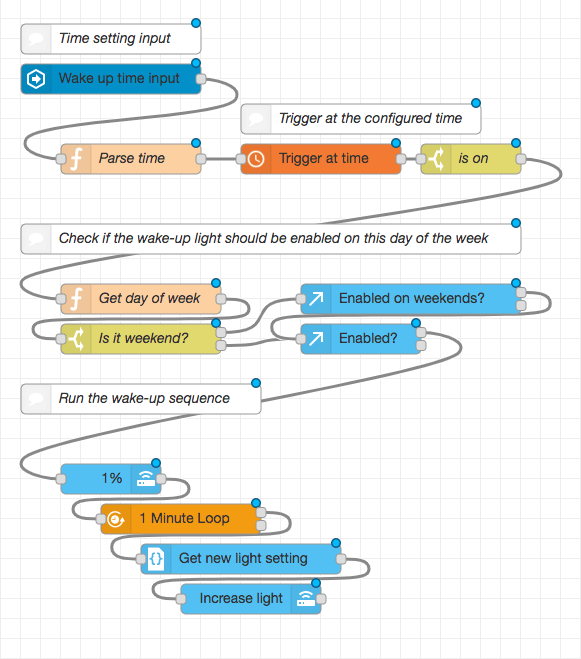 The first step in our flow is reading the wakeup_time from Home Assistant. This time is then passed on to a schedex node. The schedex node is a easy-to-use node to start something at a configurable time. An alternative is BigTimer but for something simple as this I prefer schedex. The schedex node sends a message at a specific time that can be configured. This perfectly matches our requirements as we would like to start the wake-up light at a configurable time (without changing the flow each time the time changes). These three nodes make sure that: 1) each time we change the wake-up time in HA the schedex node is updated and 2) the schedex node triggers a message at the configured time. The configuration of the schedex node can be used to set some default values. I let the node send an ‘off’ message 60 minutes after the wake-up time started; you could use such an off message to run some additional automations. The wake-up light can be disabled or only enabled on week days. To implement these requirements we add a filter after the schedex node that checks if the requirements are met. The last step is to connect the output of the “Enabled?” node to a sequence that controls the lights. You can go wild here and create something based on the light setup in your bedroom. In my case I start the lights at 1% brightness and then slowly increase the brightness for 30 minutes. After 30 minutes, when all the lights are at max brightness, it further sets my home to a ‘morning’ state and turns on lights in other parts of the house. To get started with this setup you can use the json source code of my nodes and customize them to fit your needs. At a minimum you need to change the entities of the lights that you would like to control. Questions? Feedback? Feel free to add them to the comments of this post. This post is part of a series of posts on Home Automation. These posts usually cover a part of my own smart home or a project I worked on. I make heavy use of Home Assistant, Node-RED and AppDaemon to control my home; these posts are examples of this. Notice on Amazon or product links: Sometimes I link to products on Amazon that I bought or that could be used to implement one of my tutorials. Some of these links contain an affiliate code from the Amazon Associate Program and I could earn from qualifying purchases. These links are personal recommendations (of products I use myself) or suggestions of products that could be interesting. However, please don't folow my advice blindly as each Smart Home has different needs and requirements.